Israel-based SiOx RRAM developer Weebit Nano demonstrated in November 2017 a 40nm working ReRAM memory cell. 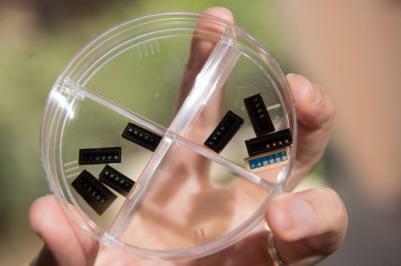 The company has now announced that it has successfully scaled up the single memory cell into a 4Kb array. Weebit Nano says that an analysis of the 4Kb wafers showed no degradation due to scaling. The company is now confident in its goal of a working 40nm 1Mb array by mid-2018. Earlier this year, Weebit Nano announced that it aims to produce 40nm working SiOx RRAM cell samples by the end of 2017, and the company today announced that it achieved that milestone - one month ahead of schedule. Weebit further reports that measurements performed on the 40nm memory cells on various wafers verified the ability of Weebit Nano SiOx ReRAM cells to maintain its memory behaviour in accordance with previous experiments performed on 300nm cells. Israel-based SiOx RRAM developer Weebit Nano recently announced success in demonstrating a 4Kbit array in 300nm. Weebit now updates that it has successfully demonstrated the reliability of data retention and endurance in its 300 nm 4Kb memory cells. data retention lifetime extrapolation demonstrated the ability to maintain written data for 10 years at above room temperature. In addition the chips maintained their data after 30 minutes at 260 degrees, exceeding the soldering requirements of 15 minutes at that temperatures. Weebit says that these results successfully conclude the 300 nm 4Kb characterization. Weebit says that the endurance results are significantly higher than the program/erase cycling of existing Flash technology. Israel-based Weebit Nano was established in 2014 with an aim to commercialize Rice University's SiOx RRAM technology. Weebit is progressing towards it stated goal of producing a 40nm RRAM Silicon Oxide working cell by the end of 2017. Coby Hanoch was recently appointed as the company's new CEO, and was kind enough to answer a few questions we had. Coby was VP Worldwide sales at Verisity where he was part of the founding team and grew the company to over $100M sales per year. He was also VP Worldwide sales at Jasper. Mr Hanoch holds a Bachelor of Science in Systems Design from Technion – Israel Institute of Technology. Q: Coby, you recently joined Weebit as a CEO. What made you excited about Weebit's technology and business? I believe Weebit’s technology has great potential, especially considering the fact that it is based on standard materials and tools, so once we finish the development we should be able to move more easily into production than other emerging memory technologies I have come across. In addition, and probably more important than the technology, a key driver to the success of a company is the team, and I was very impressed by Weebit’s team and the atmosphere in the company. Weebit Nano announced that it has managed to produce a 4Kb array on 300 nm cells, with 100% yield on selected arrays. Weebit says that this result validates its technology and that this demonstration was the final significant step towards the next goal for the company - a 40nm RRAM Silicon Oxide working cell by the end of 2017. Preliminary speed tests of Weebit's technology showed that write speeds could be 100 to 1000 times faster than traditional 3D Flash technology while using significantly lower energy. Weebit Nano announced that electrical tests conducted on its SiOx RRAM at the Leti institute in France has been succesful. Leti performed extensive testing on critical memory parameters such as programming and erase voltage. Weebit further says that it is now able to move forward with its plans to scale down the RRAM technology to 40nm. A couple of months ago, we reported that Israel-based RRAM developer Weebit Nano partnered with France-based research institute Leti, to co-develop advanced RRAM devices based on silicon oxide. Weebit Nano now announced that its SiOx ReRAM memory technology has been successfully transferred from Rice University’s facilities to Leti’s pre-industrialisation facility in Grenoble, France. Leti's initial experiments confirm that Weebit’s unique nano-porous SiOx process is reproducible. Israel-based RRAM developer Weebit Nano announced that it partnered with France-based research institute Leti. Leti and Weebit Nano will work on advanced RRAM devices based on silicon oxide. As part of that agreement, Weebit will gain access to the advanced facilities of Leti, including an 8,500 square meters semiconductor cleanroom area. Israel-based RRAM developer Weebit Nano has made its debut on the Australian share market, trading under the ticker ASX:WBT, following a reverse merger with a mining company shell called Radar Iron Ltd.
As part of the share floating, Weebit raised $5 million AUD, and the company reportedly aims to raise a further $10 million AUD in the coming weeks. The company's shares started the day at 5 cents but ended it on 4 cents putting the market cap at $13.4 million AUD. Weebit Nano announced a "significant breakthrough" in its nano-porous silicon-oxide (SiOx) RRAM memory devices development. Weebit has managed to scale down its device filament (the conductive path that either allows a current to flow or not) to a sub-5nm scale, without any deterioration of performance reliability. Weebit, based in Israel, is commercializing technology originally developed at Rice University. The company is currently negotiating with "major semiconductor manufacturers" regarding joint venture development. The company expects to show a commercially viable product within 18 months.